With 19 nonstop destinations you can get there from here. Travel Smart. Travel TUS. 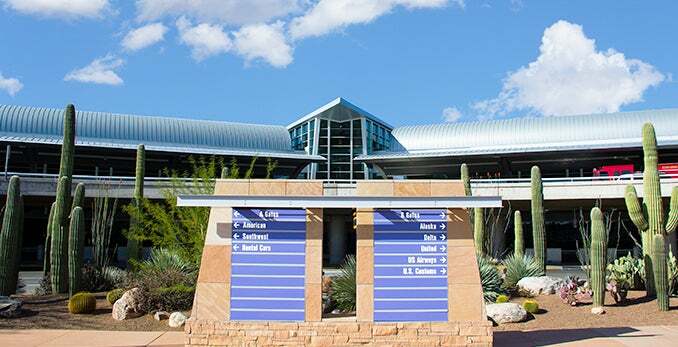 Tucson International Airport is domestic airport located in Tucson, Arizona , United States and serves domestic and rare international flights to 80 different destinations, connecting Tucson, Arizona with United States, Mexico, Great Britain, Canada, Puerto Rico and Australia. The most popular destinations to fly to from Airport are Los Angeles, Salt Lake City International Airport, Denver International Airport, Atlanta and Las Vegas . The longest flight you can take is to Atlanta (3:56 hours) . Carriers such as Southwest Airlines, American Airlines and Delta Air Lines have regular flights to and from Airport.